I love this dish, it’s super quick to make, looks fantastic and can be made quite ridiculously healthy or unhealthy depending on the pesto. The idea was very much based on raw vegan spiralised courgette, I’ve tried on a couple of occasions to eat the courgette raw but either I’m doing something wrong or my tummy just doesn’t agree with raw courgette. By steaming the courgette for 10 minutes it keeps a reasonable amount of bite, holds together and makes for a very satisfying meal. 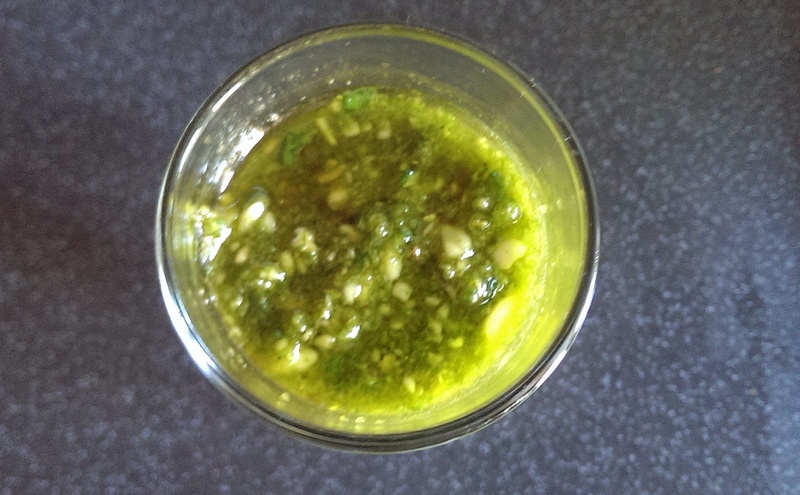 The pesto was just a throw together recipe, and is rather nice, but if you have a favourite recipe for pesto it’s probably best to just use that! As the courgette is making up the vast majority of the meal I’d recommend two per person, he photo gives a good idea of how much this looks like. If the tomatoes in my fridge had been slightly less elderly (they were heading off to register to vote) then I would have sliced them up and thrown them in too to both add a splash of colour and a good contrasting flavour to the rich pesto. Anyway after all that blurb, the recipe is simplicity itself. 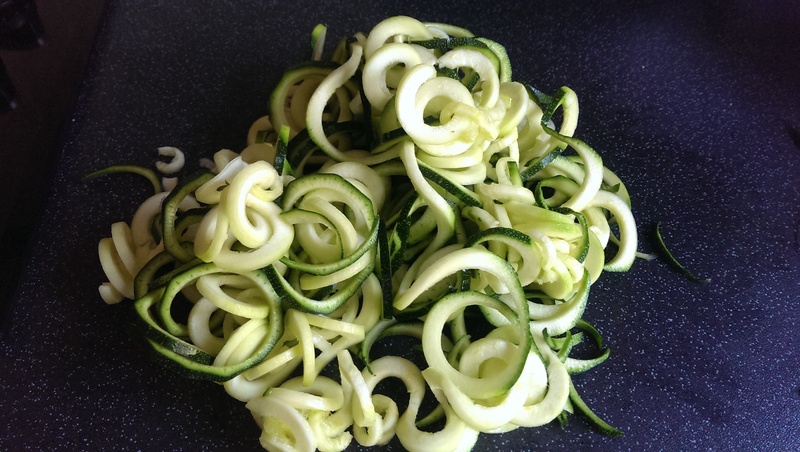 Either spiral cut the courgette or slice into long thin strips. Pop in the steamer for up to 10 minutes. Whilst it’s steaming, assemble the pesto. Pop the pine nuts in a dry pan and gently warm them through till they start to turn to a pale golden brown, you do need to keep a close eye on them as they can turn from pale to burnt very quickly. Place all the ingredients in a blender or food processor, including the pine nuts, and mix till just lumpy. It’s perfectly possible to make this by hand in a pestle and mortar or even in a bowl with the back of a spoon and some patience. Drain as much water off the courgettes as possible, you could even pat them dry with some kitchen roll. 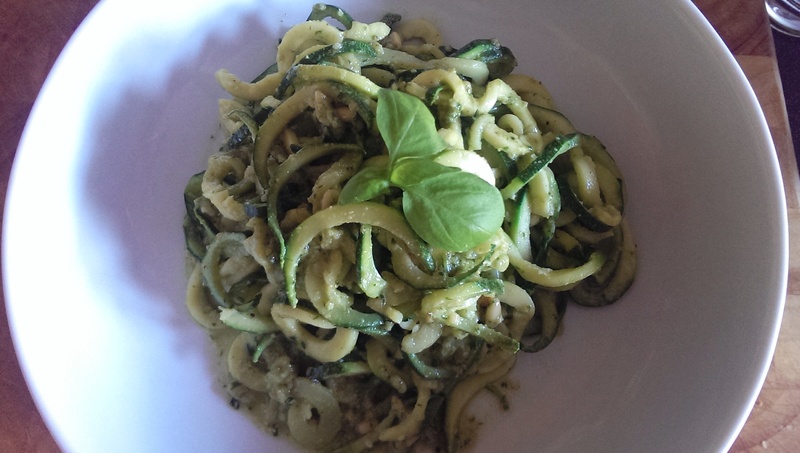 Add pesto to courgettes and eat!